Cumpara Led Marker Bmw de pe TuningRo.ro. Produsele sunt atent selectionate de pe piata globala si va asiguram ca ati facut cea mai buna alegere. Livram Rapid prin curier in 24/48 h produsele aflate in stoc. Puteti comanda si telefonic la numerele de telefon 0733607822 / 0746309919. LED MARKER ANGEL EYES 7000K 10W 260lm BMW E63/E64 SERIA 6LED Marker 10W CREE High Power - schimbarea.. LED MARKER ANGEL EYES 7000K 10W 270lm BMW E39 SERIA 5LED Marker 10W CREE High Power - schimbar.. LED MARKER ANGEL EYES 7000K 10W 270lm BMW E87 SERIA 1LED Marker 10W CREE High Power - schimbar.. LED MARKER ANGEL EYES 7000K BMW E53 X5 10w 270lmLED Marker 10W CREE High Power - schimbarea culorii .. LED MARKER ANGEL EYES 7000K 10W 270lm BMW E65 E66 SERIA 7LED Marker 10W CREE High Power - schi.. LED MARKER ANGEL EYES 7000K 10W 260lm BMW E83 X3LED Marker 10W CREE High Power - schimbarea culorii .. LED MARKER ANGEL EYES 7000K BMW E60/E61 SERIA 5 10w 270lmLED Marker 10W CREE High Power - schimbarea.. 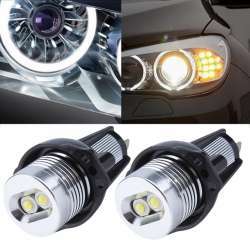 Led Marker Angel Eyes Bmw E90/E91 Seria 3 20w 450lm.LED CREE 20W - Fabricat in SUA Aceste ledur..